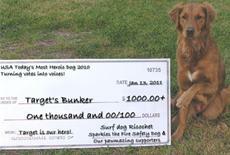 USA Today's 2010 "Most Heroic Dog in 2010"
Surf Dog Richochet with a signed check from her and Sparkles for Target's Bunker. Today we are honored that Sparkles the Fire Safety Dog, along with fellow "Most Heroic Dog of 2010" nominee, Surf Dog Ricochet, are mentioned on the USA Today website today and we wanted to share the link. Together, Sparkles and Richochet helped change the "vote to voices" to help carry on the work of Target, who saved the lives of U.S. Soldiers in Aghanistan. Thank you to USA Today's Janice Lloyd for the beautiful article that she wrote about this whole experience and thank you to Judy and Ricochet for partnering on such an amazing project! It's not too late to donate! 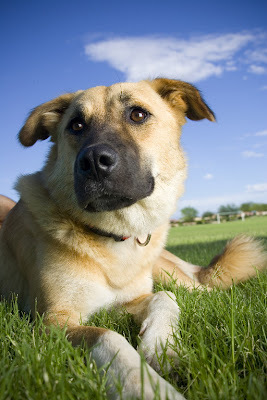 To read more about the campaign to help Target's Bunker, visit HERE on Surf Dog Ricochet's site.